Social networks are a fantastic opportunity for businesses to increase the visibility of their offers and put in place a personalised, permanent customer relationship. 86% of them already have a Facebook page and 68% have a Twitter account! In 2012, 95% of them should be present on the social networks (FEVAD study, 2011). Let’s take a look at 4 practical tips to follow to take advantage of social networking. 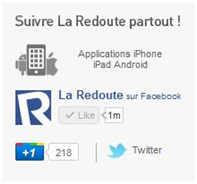 1.Increase the visibility of your website using the social networks’ share icons. Add share icons for the main social networks to your product sheets to increase the visibility of your products. Take a product sheet from La Redoute for example. Here there are 3 icons that relate to social networks: “Like” and “Send” for Facebook and “+1” for Google+. If the consumer clicks the “Like” icon, a post will appear on their wall presenting the product. 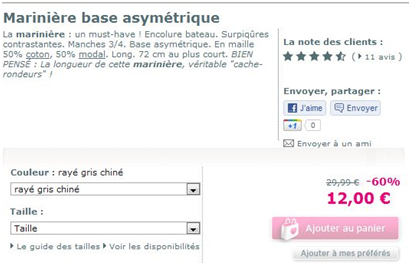 By clicking the name of the item, “marinière base asymétrique” (“asymmetric smock top”) in this case, the web user will land directly on the product sheet on the La Redoute website. This practice will provide additional visibility for your products and increase traffic to your website. The consumer’s “friends” will see the post on their Facebook page and will have the opportunity to comment and share it with their friends in turn. This post could potentially be spread from page to page and significantly increase the visibility of your products. The “Send” icon lets you tell your Facebook friends about the product. As a result, the post will appear on selected friends’ Facebook pages and not on the consumer’s page as was the case above. The Google+ sharing system works a bit differently from that of Facebook. By clicking the Google+ +1, which is the equivalent of “Like” on Facebook, the consumer will display a post presenting the product on the “+1” tab on their page. 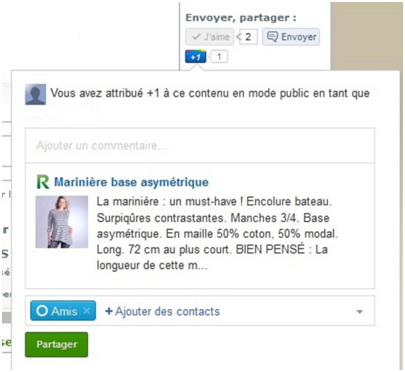 As with Facebook, the user can access the product sheet by clicking the item’s name (here “marinière base asymétrique”). 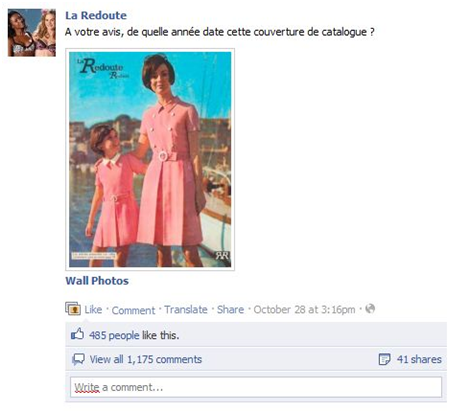 Google+ also incorporates the site’s URL address in the post (here La Redoute). Consumers can also share the post with their “friends”. Unlike Facebook, Google+ does not let you post directly on your contacts’ walls. However, the post will appear in the feeds of the contacts with whom the consumer wants to share the product. 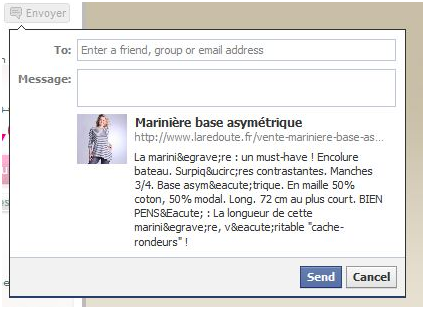 In your product sheet, add Facebook’s “comment” feature to allow more interaction between your shop and your customers. The comments posted by the latter will appear in your product sheets and on their profiles at the same time. This feature increases the visibility of your shop and your presence on the social networks. 3.Create a page dedicated to your e-commerce site. Create a Facebook page for your e-commerce site to keep your customers up-to-date with your news, promotions and all events relating to your shop. Show links to your Facebook pages on your homepage to encourage users to consult them. Google+ also started allowing the creation of brand pages a few days ago. Social networks provide a direct and permanent link to your customers. The latter can react to your posts and ask questions, expecting to receive personal replies. In this case the social network platforms are used to process individual requests. Social networks are seen as a way of finding out customers’ expectations with regard to businesses’ product offers. In 2011, 46% of businesses had created systems to analyse customer feedback on social networks and 30% more planned to do so by 2012. (FEVAD study, 2011). Encourage your community to discuss and debate your shop and brand. 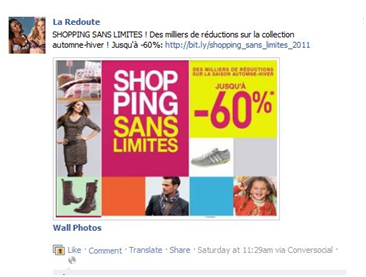 Here is an example on La Redoute’s Facebook page. Here the aim is to make consumers identify with the brand in a fun way. The Twitter network lets you communicate quickly with a large number of people. Use this network to inform your customers about all the “everyday” events relating to your e-commerce site. For example, “Tweet” them to say that such and such product has been restocked, you have organised flash sales etc. Choose Facebook for more important events.